When we were placing the big mid-October plant order from Florida this year, I, the boss, and WCW1 were scrolling through the list of offered plants on an Excel spreadsheet, and we got to a listing for venus flytraps. And I remember there was some kind of discussion of whether we needed to buy more, with WCW and I saying that we didn't because we couldn't keep them alive anyway and what was the point. The boss claimed that whenever kids enter the greenhouse, they always want one of these, and that may be true, but 1) just because they want one doesn't necessarily mean that they go so far as to ask their parents for one, 2) just because they might ask for one doesn't mean their parents are actually going to buy one, and 3) they invariably stand there torturing the plants for some period,2 regardless of whether they ask or buy or any of that, which is not good for the plants and doesn't really do us any favors either. So it looks like we've bought them to throw them away. Even if they weren't being tortured to death by small children3, we would have trouble keeping them: they need very bright sun when they're actively growing, which we only sort of have in the greenhouse (the roof reflects a lot away, and when it's too hot, we pull shade cloths over most of the house). The mineral content in tap water is a problem too. And then there's the dormancy, when they need to be just above freezing all winter, which we're not going to manage in the greenhouse, though there are other options. Point being that we're not really set up to be able to care for them, and so it's a little aggravating to have to try. Domesticated: are widespread due to deliberate human cultivation and, while they may be genetically distinct from wild members of the species (which may or may not be extinct in the wild), are in no danger of population extinction. Least Concern: we're worried enough to have assessed the status of the population, but the species is not considered at risk of population reduction. Near Threatened: have been reduced in numbers or range enough that the species could conceivably qualify for Threatened status in the near future. 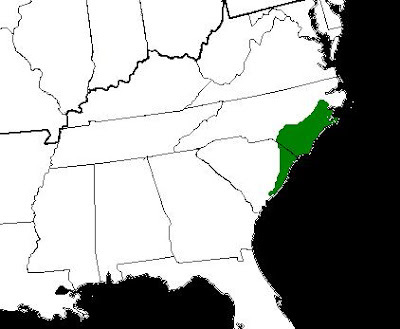 Conservation Dependent (no longer officially assigned): would become threatened within five years, were it not for conservation efforts directed at maintaining the numbers of that species. Threatened: could possibly become extinct in the near future. Vulnerable: likely to become endangered unless threatening circumstances (loss of habitat, competition from invasives, etc.) improve. Endangered: at risk of becoming extinct. Critically Endangered: are at extremely high risk of becoming extinct (more or less, expected to go extinct, though nobody actually phrases it that way). Extinct in the Wild: no members of the species are alive anywhere on the planet except in captivity. Extinct: no members of the species are alive anywhere on the planet. Because of the precarious position of the wild plant, plants for sale are usually derived from tissue culture (generally they will say something to this effect on the tag or packaging; it's probably a good idea to pass up any plants that don't make this explicit) and are likely still pretty young when sold.5 So the virgin in "Sacrificial Virgin" is not just poetic and anthropomorphic: not only have plants in stores probably never flowered, neither did the plant they came from. One of my minor personal goals is to keep the Venus flytraps at work healthy enough that we won't have to throw them out. To this end, I've talked to the boss about maybe getting them a winter dormancy, and she's agreed that this is something we can try, eventually. (Possibly they'll even get distilled water!) If I manage to pull it off, I'll be very happy with myself: sparing the lives of the current crop when nobody else has bothered to before would feel like a real accomplishment. It bugs me any time I have to throw plants out. Of course, I'm not going to count on being able to keep them going, either. 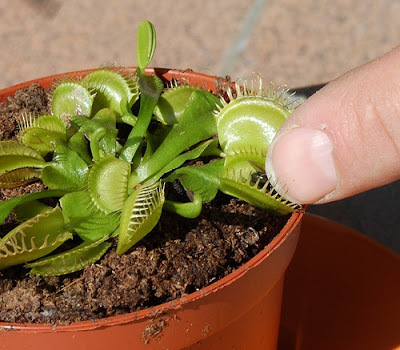 UPDATE: Found a time-lapse movie of Dionaea muscipula growing; my post about it is here. 2 Though it's totally understandable that you'd want to see it, standing there poking at the traps until you get one to close can easily damage the trap, and even if it doesn't physically damage the plant, it still uses a lot of energy that would otherwise be used for growth, stunting the plant. One of the nursery guys dealt with this by getting one and gathering a small crowd around him before triggering a trap or two, so everybody could see it without each person having to do it for themselves, which is smart. 5 Tissue culture is cloning using small chunks of plant tissue in a sterile medium. Plants are cleaned, sterilized pieces of the plant are removed and divided, and then the groups of cells are placed in a nutrient medium containing hormones which induce the cells to reorganize and form a plant. If this sounds freaky to you, and you're alarmed about biotech scientists playing God by cloning in this way, consider: cloning is also what you're doing if you take a cutting and root it in water, so calm down already. For me it is one of the easiest plants to grow. I woud acually rate it as a four. You may wany to leave them in the terrariums they come in due to the lack of distilled water, they are only short term residents to your greenhouse. The ones that you dont sell can be taken home and grown properly out of its terrarium. If this plant makes a flower stalk remove it. I'm dedicated to growing Carnivorous plants, such as Nepenthes, heliamphora, and others, I've found VFTs to be quite easy, just put them outside, and water them with rainwater. You might want to put it a bright spot before putting them in full sun. 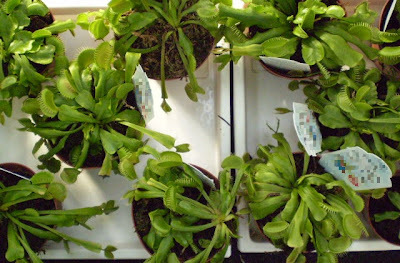 Dionaea are wonderfull plants however they tend to die due to being bought by unknowing customers. When I was young I had one, needless to say it died within a month because we had been giving it tap water. Nowadays I have one that has been neglected by his previous owner (all the roots and nearly all the leaves had died) and it's actually growing again. Not as good as I want it to, but still it's doing better then it did. It will do just fine with peat and distilled/rain water. Will probably have to put him (or figure out how to) in winter dormancy as they will die after 2-3 years of nonstop growing. These are EASY to grow, but sadly a lot of crap is written about them. They do need full sunlight and pure rainwater to sit in. NEVER EVER fertilise or use potting soil. They grow well in spaghnum and/or peat moss. DO NOT give them shade and NEVER terranium conditions. 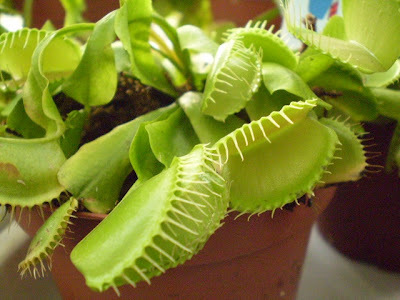 Don't feed them meat, cheese etc and don't unnecessarily spring traps as this uses a great deal of the plants energy up. Many people think their plants are dead when in fact they are deciduous and lose their leaves over winter, but come racing back in Spring. That's normal and something the growers never include on the labels. The best resource re growing these is a USA website, "Saracenia Northwest."